Universal Music is pleased to announce the release of Marc Bolan at the BBC, a 6 CD Collection scheduled for release on August 26th. 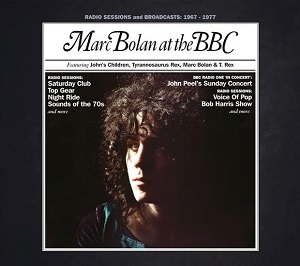 It is the most ambitious and complete collection of Marc Bolan’s BBC recordings so far – of the 117 tracks almost half appear here for the very first time. A 2 CD collection, Marc Bolan at the BBC – The Best of the BBC Recordings will be released simultaneously. Marc Bolan at the BBC has been compiled and researched by Clive Zone, a veritable Sherlock Holmes of the Bolan scene, who has spent over five years working on this set, gaining access to collector’s ultra-rare reel-to-reel tapes and BBC Transcription Discs that even the BBC no longer seem to have in their archive. According to Clive Zone, of the 117 tracks in the box set, 16 of the Tyrannosaurus Rex tracks are previously unreleased. There are more than 20 previously unreleased T.Rex tracks and of the interviews 12 (many in depth) have never received an official release. In addition, a number of the tracks that appeared on the now unavailable, 2007 Bolan At The Beeb box set are presenting in their entirety and in some cases utilising better quality recordings than in the past. This stylish and comprehensive new 6 CD collection includes sleeve notes by Mark Paytress(author of Marc Bolan – A 20th Century Superstar) and was designed by Phil Smee and given a historic Radio Times look. Clive Zone spent weeks at the BBC Written Archives Centre in Caversham verifying information on sessions and concerts and pouring over copies of Radio Times at the Westminster Central Library to find the original entries used in the booklet. Marc Bolan at the BBC promises to be a feast for the eyes and ears. Disc One opens with the one and only session recorded by Marc’s first band, John’s Children, recorded for the BBC Radio One – Saturday Club in June 1967 and also includes all of the sessions recorded for John Peel’s Top Gear programme between November 1967 and December 1968. Disc Three contains the Top Gear session from October 1970, 2 songs from the long lost Bob Harris session from November 1970, a Dave Lee Travis session from December 1970 and 5 songs recorded live for the December 1970 broadcast of the John Peel Sunday Concert. Disc Four features 8 songs recorded for the Radio One Club and broadcast in March and July of 1971 plus a session recorded for the Bob Harris “Sound of the Seventies” show in August 1971 plus an interview with Tony Norman in 1971, Keith Altham in 1972 and a stunning recording of Telegram Sam for the January 1972 Peter Powell show. Disc Five and Disc Six contain mixes which were exclusively recorded for the BBC between May 1972 and January 1974 plus interviews with Marc which he did with Johnny Moran, Nicky Horne, Anne Nightingale and David Hamilton.